Anyways, since I am trying to post regularly and post on things like working out and cooking and such, here’s a recipe! We had enchilada night last night and since I also happened to have the quintessential summer drink, Bud Light Lime, in hand, it turned into a full-on fiesta! 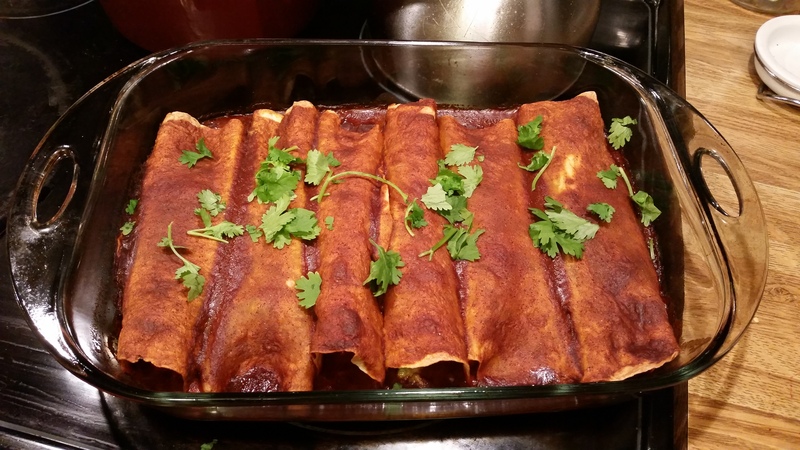 This enchilada recipe is awesome and, wait for it, CHEAP! Perfect for grad students. 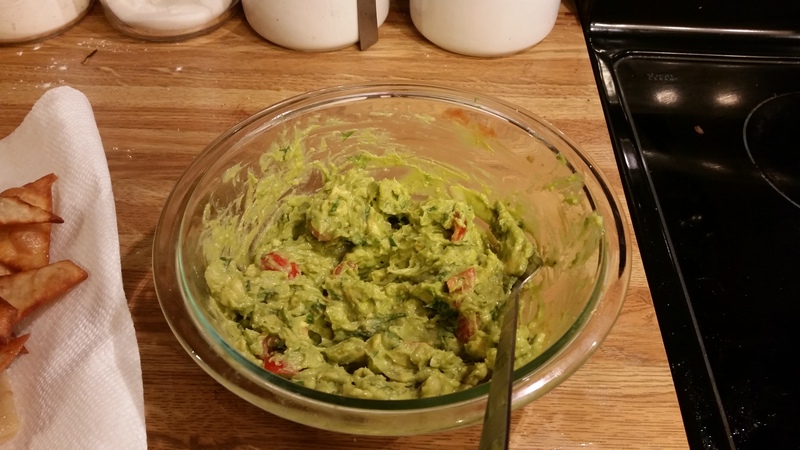 We had extra avocados so there was also guacamole and homemade chips involved because what else are you going to do with extra avocados and tortillas? Preheat oven to 350 degrees F. Then prepare the enchilada sauce. In a medium sauce pot combine the vegetable oil, flour, and chili powder. Heat the mixture over a medium flame until it begins to bubble. Whisk and cook the bubbling paste for 1-2 minutes. Slowly pour in the water while whisking. Add the tomato paste, cumin, garlic powder, cayenne pepper, cocoa powder, and salt. Whisk until smooth and continue to heat over a medium flame. Let the sauce come up to a gentle simmer, at which point the sauce will thicken. Once thickened, turn off the heat and set the sauce aside until you’re ready to use it. Drain and rinse the can of beans, then add them to a large bowl with the shredded chicken. Cube the avocado, dice the tomato, slice the green onion, and pull a handful of cilantro leaves from their stems and roughly chop them. Add them all to the bowl, along with the frozen corn kernels and lime juice. Stir everything together. Season with a little salt and garlic powder (recommended amounts above, or use fresh minced garlic). Gently mix in the cheese so you don’t bruise the avocado. Coat an 8×8 casserole dish with non-stick spray. Warm the tortillas briefly in the microwave to make them soft and pliable. Fill each tortilla with about ⅓ cup of filling and roll tightly. Place the filled tortillas in the casserole dish, seam side down. Once all of the filled enchiladas are in the dish, pour the enchilada sauce over top. Bake the enchiladas in the preheated oven for about 25 minutes, or until they’re heated through and the sauce is bubbly along the edges. If you want to add even more cheese on top of the enchiladas, I think that would be a fantastic idea. More cheese = awesome! 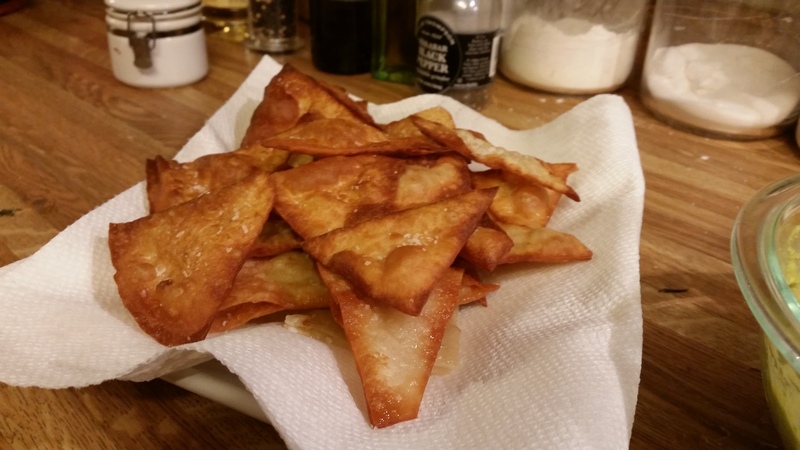 We had some leftover tortillas from the enchilada recipe and a lack of tortilla chips in the house (I know). So, I cut up the remaining 3 tortillas into chip size and fried them in 1/2 in of sunflower oil (Don’t overheat your oil, 350-375 degrees is where you wanna be at) for 1-2 min per side. And OMG I forgot how good fresh flour tortilla chips are! Especially with homemade guacamole. And Bud Light Lime. And hot enchiladas. And a nice spring evening.